All commercial cooking establishments in New York City are now required by law to have an operational grease trap for their food preparation activity. Proper maintenance and disposal of your grease trap is essential to the sanitary operation of your kitchen along with staying compliant with local and state regulations. Above all, our environment is kept clean and safe. What Problems Are Caused By Grease? A grease trap is a device designed to capture and prevent grease from entering the plumbing system. These units vary in size and are usually placed in the kitchen area. 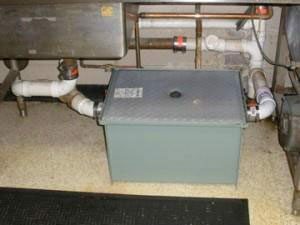 A grease trap is a box that has a series of internal baffles. Water is allowed to pass through the trap while keeping grease and sludge contained. Like any “filtering system”, the contained grease must be periodically removed. 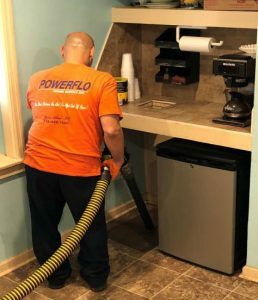 How Does PowerFlo Clean Grease Traps? A qualified technician in a specially equipped vacuum truck will arrive on site and check in with management. Our technician will then prepare the work area and discuss a short pre-work checklist. Your grease trap will then be pumped, scraped and washed. The grease will be hauled off site and disposed of in accordance with environmental regulations at a licensed facility. Before leaving, our technician will offer the manager an opportunity to inspect our completed work. 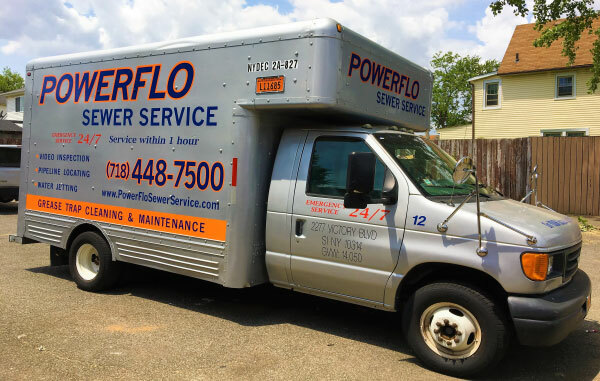 PowerFlo will provide all the necessary information and documentation, including maintenance dates required by local government agencies as proof of your compliance with local laws. Technicians and office staff are always on-call and available. Additional 10% discount on sewer and drain cleaning services. Eliminate disruptions by choosing the days and times that work best for you. We will help you customize a plan to your specific needs. Relax. We handle all record keeping and document control.